[Matrix-Q Thinking out of the box] GENDER: a binary or nonary issue ? The researcher introduces a new perception, approach to gender, through nonary thinking and Matrix-Q thinking. Suggesting benefits of the use of nonary thinking and the 9 genders skills (archetypes) on several fields. Through multidisciplinary research and innovation, at the Matrix-Q Research Institute we are arriving to the development of a series of tools, that with foundation in gender cocreativity, will advance effectiveness in a variety of disciplines. From education, to business, research, technology, health, sustainable development and others. The researcher introduces briefly a list of publications and references (URLs) by the researcher, based on matrix-q thinking and nonary thinking. As well announces an online meet up scheduled for discussion and introductions to Matrix-Q Thinking, invitation to the scientific community. A nonary approach on gender, would help us shift from gender equality (binary thinking) to gender cocreativity and 9 gender skills integrated to society, multidisciplinary applications. For each discipline several adjustments, improvements in policy, protocols, tools, methods, management, strategy and process can be implemented by utilizing a nonary thinking approach. The practice of nonary thinking and in general Matrix-Q thinking will advance cognitive, strategic, decision making and leadership skills. Matrix-Q Thinking meet ups, master class, experiential trainings with focus on development of skills, will help researchers, leaders, innovators, SDG Entrepreneurs, consultants, coaches and trainers integrate nonary thinking into their activities. The 9 Gender Archetypes or Skills, can be developed by each individual, and do not define a limitation into one or another as an identity. I have recently taken some additional time to review for example how gender studies as background knowledge, have and will have, an impact on our approach to phenomena (human, natural and artificial phenomena), and in general to global sustainable development issues, asking for a global culture and civilization foundations. Which are the foundations we wish or need for a global culture and civilization ? My suggestion is to utilize nonary thinking instead of binary thinking for purpose of gender studies as well as for application of research on gender and in particular for achievement of sustainable development goals as foundation for a global culture and civilization. 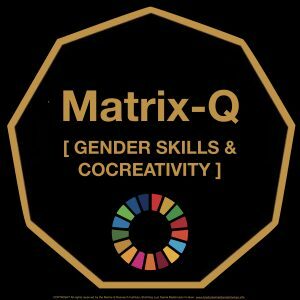 Through Matrix-Q thinking out of the box methods and knowledge i have tried to suggest groundbreaking changes in the perception of gender, also considering our modern global intent and efforts (SDG2030, SDG5 , PTƟ SDG HUB ) on gender equality, balance, inclusiveness, cocreativity. How we perceive phenomena, which thinking model or approach we will utilize, and how we apply our thinking to an issue that we wish to solve, may create a groundbreaking change of results, process, assessment, and conclusions, even innovation, that through other thinking approaches was not feasible or predicted. I think nonary thinking vs binary thinking in gender field, creates a very challenging topic for discussion, that is in general not so common to take as relevant for business, education, social studies; even gender is a field of study itself, the binary approach has been taken for granted, so far i know, and i do not understand why. Binary thinking: there is male and female. Nonary thinking: human identity and skills may very from case to case and situation, through 9 archetypes of gender. In some cases sexual preferences will be pre set in other not, as well as skills for leadership, problem soling, effectiveness, or learning. Nonary thinking in general help us describe and understand gender from a congruent perspective in relation to modern and also ancient cultures human social and individual practices. From which we may have not enough records, as religion, politic, or cultural costumes may have in some countries, locations, communities, clusters of people and ages, limited the ability of society or history to include all 9 genders archetypes as part of their accepted social life or human possible realities (human potential). 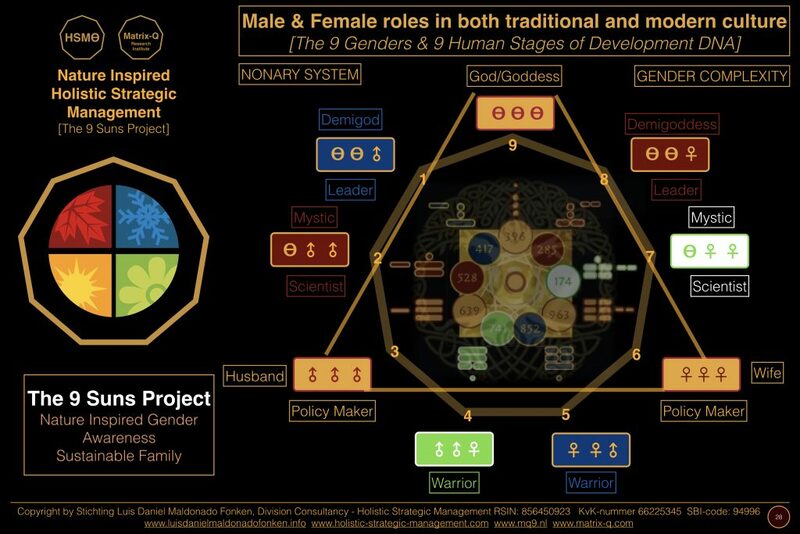 The 9 Genders model focus on gender cocreativity, which explained through the binary approach would mean that both men and women are more effective when in collaborative process together, than one alone or instead of the other, as for natural reasons [ The Nature Inspired Business Model System – Based on Fertility and Cocreativity ]. Multidisciplinary applications of this approach will be suggested below. Which are the models of thinking, challenges and opportunities “gender” fields of studies creates for the global emerging culture, sustainable development goals, education, society, family, strategic management, entrepreneurship, governance and scientific research? How would help nonary thinking and nature inspired thinking (Matrix-Q Thinking) to solve those challenges or profit from those opportunities ? Which are the pros and cons of nonary thinking and binary thinking models ? Through the review of multidisciplinary applications of nonary and matrix-q thinking we will intent to answer those questions. For example in the field of business, new gender inclusive business model, which can be used to advance effectiveness, through gender cocreativity. For which particular skills, according to the 9 genders archetypes, are necessary or ideal asset for each business development stage or milestone. In field education, nonary thinking suggests 9 fields of application of knowledge and through the cypher 2 (gender cocreativity) 9 genders approach to the 9 fields of knowledge, not only 2. For the study of human intelligence, behavior, decision making, 9 genders, or 9 identities, are relevant. Skills for leadership, management, communication and collaboration vary according to the 9 genders archetypes. Social management studied through nonary thinking is more precise, see example of a society managed by bonaty models like the i ching in comparison to societies studied by nonary models like the i ching theta (generator of Matrix-Q Nonary Thinking) for which the gender cocreativity and 9 genders archetypes can be utilized. Emotional intelligence studied in 9 classes of emotions or intelligences, from the perspective of nonary thinking in field gender. Martial arts, performing arts, stress management, burnout prevention methods, techniques for which nonary thinking is applied and 9 genders archetypes. Community, leadership, strategic management, effective skills building through community living must consider 9 gender skills and cocreativity as essential aspect of their training. Matrix Quotient of intelligence is of nonary nature. Systemic classification of business management styles and entrepreneurship approaches. For which it is suggested an ideal organizational model for each business approach, according to the 9 genders archetypes. A Mathematic system which enables algorithms of nonary nature, that are able to include 9 gender archetypes and gender cocreativity. A.I. and Human Cognition synch. through nonary thinking based algorithms. A theory of the universe, tools for scientific research, developed through nonary thinking. Innovation in fields immunology, high tech, nano tech, mathematics, A.I., Leadership, Education or Holistic Strategic Management ( PTƟ Matrix-Q Body of Work) through nonary thinking. MATRIX-Q THINKING means nonary thinking in context. The Matrix-Q Research Institute have scheduled online meet ups dedicated to discussion and introduction on Matrix-Q Thinking – Thinking out of the box.